MID-ARGYLL: Two White-fronted Geese nr Poltalloch (East Lodge) today (James Lehmann). It looks like this once traditional flock here is almost extinct now. On 6th Feb Robin Harvey noted 11 Turnstones foraging in the drift seaweed and 15 Black Guillemots now in breeding plumage, in front of their nesting sites in the sea wall on the esplanade in Oban. KINTYRE: A Glaucous Gull still present at Tarbert harbour first noted on 5th Feb (Birdguides). 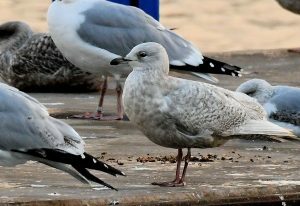 Eddie Maguire reports: at Campbeltown harbour; an adult and a 2CY Iceland Gull loafing on the pontoons late afternoon. 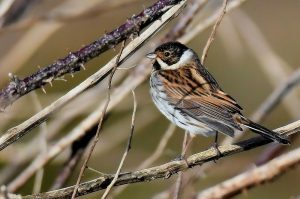 Bleachfield; the number of Reed Buntings has risen to 11. Of interest; notification received with details of the French-ringed Goldfinch that was trapped at MSBO last spring ringed on 11th February 2017 at Les Roberts, Liart, Ardennes, France and Controlled at MSBO on 19th April 2017 – distance: 925km. Iceland Gull – Campbeltown harbour, Kintyre 9th Feb (Eddie Maguire). Reed Bunting – The Laggan, Kintyre 9th Feb (Eddie Maguire).